Janet Golden is a Professor Emerita at Rutgers University--Camden. Most recently, Dr. Golden authored Babies Made Us Modern: How Infants Brought America into the Twentieth Century. 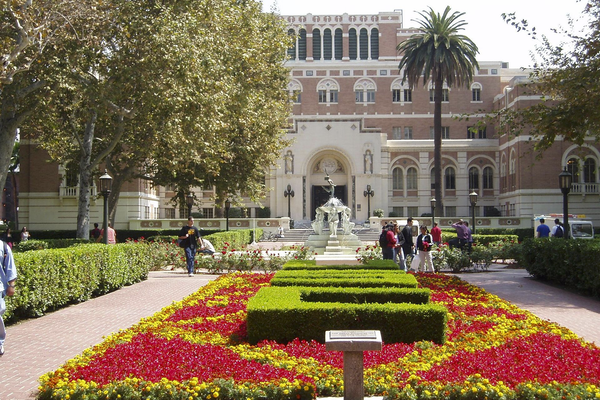 The University of Southern California, one of the schools mixed up in the college admissions scandal. The front-page news about the college admissions bribery arrests has people talking about social class, fairness, status anxiety, helicopter parenting, and whether an expensive education can translate into a lifetime of wealth and happiness. None of this is new. In writing about the history of babies in the 20th century United States, I discovered early 20th century baby books distributed by banks and insurance companies prompting parents to save for college. At a time when less than 20 percent of Americans completed high school and far fewer went on to higher education, financial institutions told parents to start saving for college. Insurance companies, banks, and savings and loan firms enticed customers by encouraging parental hopes and dreams. Just as manufacturers of disinfectants, patent remedies, and infant foods turned to baby books to advertise the products parents could buy to keep babies healthy, financial firms sold their services as ways for making babies wealthy and wise--in the future. For all kinds of companies, playing to parental anxieties and aspirations became the means of expanding their clientele. Consider this example. In 1915 an Equitable Life Assurance baby book advertisement in the Book of Baby Mine began, "Say, Dad, what about my college education?" At the time, high school graduation rates hovered below 13 percent and college attendance and graduation was much lower. Nevertheless, parents looked to the future with great hopes for their offspring. In 1919 the United States Children's Bureau conducted an investigation of infant mortality in the city of Brockton, Massachusetts. An immigrant Italian mother interviewed for the study reported she was saving to send all four of her young children to college. Clearly, in reaching out with a save-for-college message, financial firms were capitalizing on a common but mostly unrealized dream and helping to reinforce the message that college was a pathway to success. Banks promoted thrift by reaching out to customers via motion pictures, newspaper advertisements, and programs in schools collecting small deposits from children. Competition for savers grew as the number of banks doubled between 1910 and 1913. Accounts for babies soon became part of banks' advertising strategy. Savings and loans and banks gave away baby books with perforated deposit slips, slots for coins, or simply included pages for listing deposits into the baby's bank account. The 1926 Baby's Bank and Record Book even included a section on college savings estimating a future scholar would need $1000--a figure it derived, the advertisement explained, from the University of Pennsylvania catalog. In addition to citing this source, the ad included a helpful chart showing that saving $1 a week would, with compounding interest, yield $1065.72 in fifteen years. The Great Depression wiped out many of the banks and small insurance companies holding the savings of infants, children, and adults, thus erasing the hopes of many who had dreamed their child would obtain a college education. However, as children withdrew from the workforce because of the lack of job opportunities and New Deal laws limited their employment, high school completion rates grew to 40 percent by 1935. As scholars have pointed out, G.I. benefits after World War II (the Serviceman's Readjustment Act) and the National Defense Education Act of 1958 both led to big increases in college attendance thanks to the financial support they provided. What changed in the wake of enhanced federal financial support was not the desire for one's children to acquire more education, but the numbers of young people able to go to college. A quick look through baby books from the first half of the twentieth century shows the "go to college" message being sent and received well before government dollars came in to the picture. Banks and insurance companies knew what customers dreamed of for their offspring and they made it the centerpiece of some of their advertising. Today, the vast majority of students and families still save up and borrow to afford higher education. And, of course, financial firms still promote themselves as critical resources for fulfilling this dream. What just might surprise us is how, for over a century, banks and insurance companies have been delivering this message, aware of what parents thought about when they gazed at their new babies and thought about their futures.